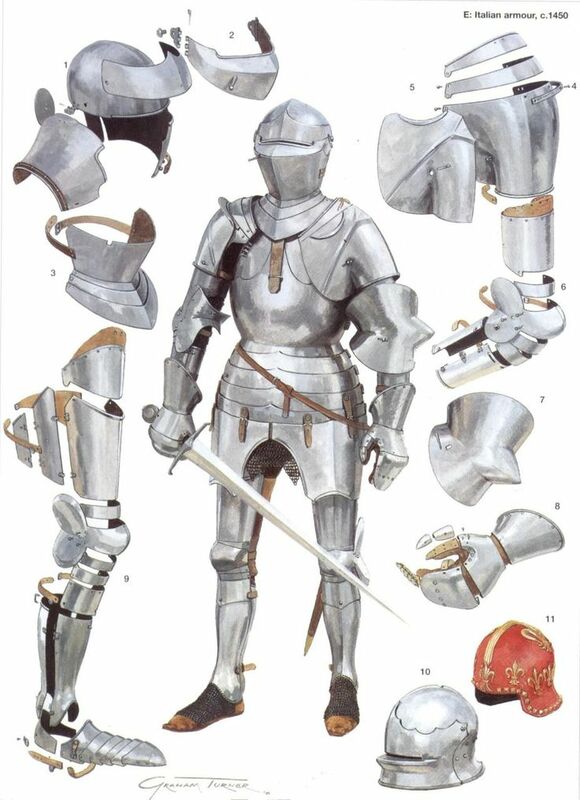 My question is: there is such basis for a traditional "fish-tail" style of plate armor in Spain? Could we find these at Aragone Sicily and Portugal as well? And attached below a foto of an effigy in Zafra which might depict the style of armour you are looking for. The differences in the plackart between the supposed Spanish style and contemporary Italian examples don't seem very large, and there are so few extant examples, so it seems very difficult to draw any conclusions one way or the other... I'm not familiar enough with Spanish effigies to say if they show any consistent differences or trends in style, so that might be interesting to look into. Thanks for the link, Timm. Also, although that's not exactly the I was looking for, its style looks something more than an untraditional german gothic (perhaps a local trend). "The cuirass is a close copy of the important Italian export of Duarte of Almeida, a Portuguese knight who served as standard bearer at the Battle of Toro (War of the Castilian Succession, 1476), now in Toledo Cathedral. This is a striking example of how Italian ers adjusted their own style of design to reflect the fashionable tastes of their foreign clients. 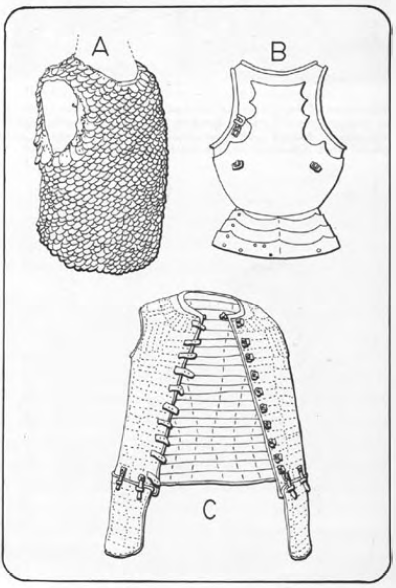 Here the smooth, rounded lines of the Milanese fashion are combined with the sharp cusps and points typical of the preferred by Iberian men-at-arms." There is supposed to be some Moorish-influenced design in the decorative goldwork on Ferdinand's armour, hinting at it's intended Spanish customer, but I don't have a clear photo to show this. Instead here's a German-style sallet made by the Italian Negrolis for Ferdinand's son-in-law Philip the Handsome, decorated with Moorish patterns... The Italian armourers were certainly willing and able to imitate foreign styles if they wished to! I am not saying that there was definitely was not a distinct Spanish style, favouring more cusps, points, and what-not... I always find it interesting when local trends can be identified. What I would really like to see is some discussion of this that offers more direct evidence beyond just Almeida.... one example is not a trend! I would definitely like to see more research into this also... Is it the case that many effigies in Spain have been destroyed like they were in France after the Revolution? 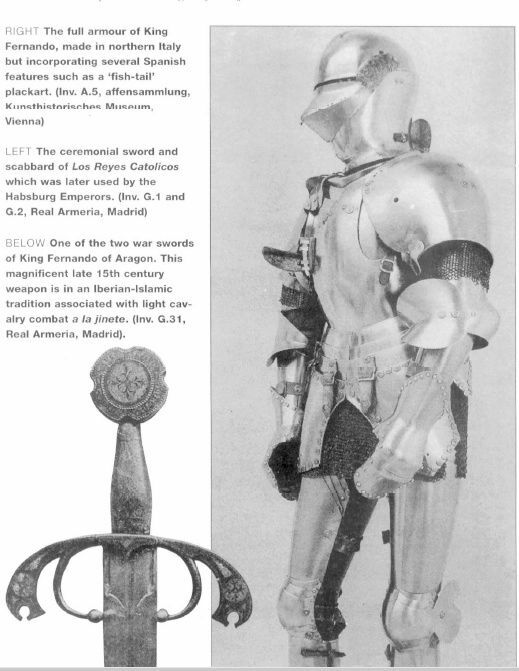 The King Ferdinand armour is very Italian, but has some features that would be unusual for an Italian armour of that date. The huge gilded rivets are something I don't recall seeing on Italian armour (including artwork), and the engineering of the pauldrons is utterly unlike anything else I know of, downright mindblowing. Their internal workings show that engineering solutions to the problem of articulation can be very different than what we are used to. Are you able to elaborate on the articulation differences? Is it a uniquely Spanish or Iberian thing? The King Ferdinand is very Italian, but has some features that would be unusual for an Italian of that date. The huge gilded rivets are something I don't recall seeing on Italian (including artwork), and the engineering of the pauldrons is utterly unlike anything else I know of, downright mindblowing. Their internal workings show that engineering solutions to the problem of articulation can be very different than what we are used to. I actually realize the 's plackart is indeed very similar to those of Duarte de Almeida. But I never thought they already had screws in late 15th century. It looks very similar to a parade atributted to Ferdinand (one that has an harpy as helmet's crest), but I never thought they were using sallets for a such late date. In any case, "Negrolis" were a family of ers? In the panels of São Vicente de Fora, we have regal figures dressing in quite "inadequate" for their stand, so to speak. The king, for example, seems to wear a mail shirt with openings in the elbows, which some guys told me that that is typical of a mail shirt designed to be worn under plate . Even more strange, the kings had iron bars over his arms and legs to protect from cuttings (similar to what poor scottish soldiers had in form of chains). I believe the most plausible explanation would be that these are s to "a la gineta", of for "light cavalry (ginete) fighting". Still, by that time even common castillian or aragonese ginetes would have plate arm harness instead of vertical iron bars. This makes me wonder if it is a cultural issue, since Portugal has always been more attached to Andalusian culture than other local kingdoms, which may have shaped and preserved certain military habits (in the Battle of Toro the Portuguese had a mixed regiment of javelineers and arquebusiers, something that the Castilians and Aragoneses didn't seem to have at the time). I'm not sure I know which helmet you are thinking of, can you share a link or photo? Yes, the Negrolis were the preeminent Milanese armourers of the 16th century (even earning mention in Vasari's Lives of the Artists). Here are some monuments that may show the Spanish-style plackart.... the first is the effigy of Juan de Vargas (c. 1515) and the second is from the tomb of Isabella's brother Alonso (1489-92). By these dates, I think the Italians have moved to completely smooth breastplate profiles, so the difference in style is noticeable. Other Hispanic details are present as well, like the bevor with eye-slit, and swords with pas d'ane. If you are willing to wade through the photographs in Goll's thesis, you can find pictures of the inside workings of the pauldrons. I remember a thread on the Armour Archive that showed them.